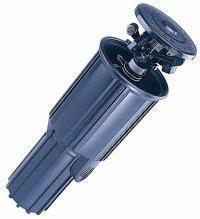 Pop-Up Rotor Sprinkler(PL-2100) - Plastico Corp. Medium gallonage flow reduces sprinkling time by watering at a rate of 3.3 gallons per minute. Spacing from 25 to 40 feet apart. 1/2" female connection at side or botton.